Alv is an ES member of the GOTT, or the Galactic office of Trade and Tariffs. 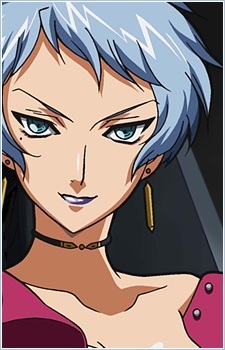 And works with her partner Dvergr to ensure normal economic activity in the Galaxy in which the anime is set. Alv is a generally disliked person in the GOTT even though she is one of the most powerful. Tweedledee states "Oh, great... It's Alv." when Alv and Dvergr appear to help them nullify a Geo-sort bomb, and afterwards it is very difficult for her to give her gratitude (Episode 8). Éclair also "Dislike(s) the way they act, as if they are so superior" and also expresses her dislike of having to go on a mission with her and Dvergr (Episode 2). Apart from this Alv is an antagonist to the story which appears later on in the series. She is regarded as evil and takes pleasure in killing people, and shows no sympathy for death and doesn't care who dies. Alv and Dvergr both have the power of Reflex and Absorb. Reflex is not really explained and the name isn't helpful. In episode 2, when a Gravity bomb is placed, and in order to escape the extra gravity they use Reflex and it lets them act, ignoring the different gravity. Absorb as an ability is only available when both Alv and Dvergr activate it, it allows them to absorb energy, and even people, allowing them to use their appearance, which is used in the main story-line later in the series. As a pair, Alv is the more sociable one and also the one who is the main reason for them being so disliked. Later in the series it is revealed that Alv is the daughter of Dvergr.